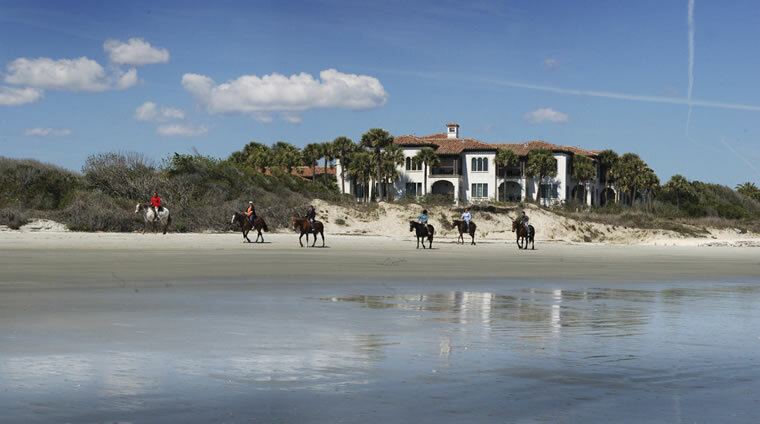 Horseback riding options at Sea Island include beach routes, which can be enjoyed by children as young as 10. Horseback riding opportunities at Sea Island encourage families to come together to experience a unique bonding activity while exploring the area. There is something special about horseback riding. Whether it is the connection riders make with the horse, or with the friends and family that they share the experience with, there is an air of excitement each and every time. Horseback riding is also a fantastic way to get out and explore in the open air. Sea Island is known for impressive coastlines, wildlife-filled marshes and shaded wooded areas, all of which can be enjoyed by horseback. The sport has been a prominent part of Sea Island history, with visitors enjoying horseback riding when the resort first opened 90 years ago. Up until 1948, the stables were open seasonally, but that all changed when Marvin Long came to Sea Island. He maintained, managed and operated the stables year-round for nearly six decades, also enlisting the help of his wife, Dot, whom he met at the resort. In addition to riding lessons, guests and members could enjoy trail rides paired with breakfast, lunch or supper, and moonlight beach rides. The stables also hosted an annual horse show for more than 40 years. The project became a family affair—even his children got in on the action, spending much of their childhood on the property. In 2010, Sea Island gave the land where Kutrufis and her father worked, called the Old Stables Corner, to the St. Simons Land Trust, a nonprofit that aims to protect the land from commercial development. A brand-new set of stables, The Stables at Frederica, was built in 2006 on the north end of St. Simons, offering expanded riding rings, on-site wooded trails and pasture for turnout. These stables, along with a Rainbow Island outpost, offer an exciting array of family-oriented horseback experiences. The beach and marsh trail rides, some of the most popular activities, leave from Rainbow Island. Children ages 10 and older can join family members on a quiet 2-mile beach ride, which crosses the river and the marsh dunes and ends up on the south beach of Sea Island. These rides last for an hour and a half, and allow plenty of bonding time among guests. The marsh is a favorite location for people who want to spot local wildlife, and the horseback marsh ride is one of the most popular ways to venture through the area. Accommodating families with children as young as 7, these adventures offer chances to view birds like heron, osprey and even bald eagles, as well as dolphins. A similar experience can be had on the wooded ride, which leaves from the main stable. This ride, too, allows children as young as 7 to come along, as the winding trails through the majestic oak trees offer a more contained path than the open beach. Riders can spot different animals here, from deer and opossums to many species of birds. Families with younger children should head to the main stables, where 20-minute pony rides are designed as an introduction to horseback riding for kids between the ages of 3 and 10. These guided experiences take little ones near the lake and give them a chance to become acquainted with the friendly ponies. The Stables at Frederica offer a Tiny Tykes Stables Tour as well, geared toward children from 3 to 7 years old who are looking to interact with the animals. While the tour also includes a pony ride around the property, children will first learn how to groom the animals, the best ways to give them treats and where to stand when near a horse. Zorn says they also offer lessons for everything from simply steering and stopping to competing nationally. Some members and guests make it a tradition, coming down to the Island each spring or summer for lessons, then practicing back home as well. She also notes that custom routes can be requested, combining travel to the beaches, marsh and woods for longer rides. While each of these experiences provides ample bonding time for families, there are other benefits as well. She says that horseback riding also improves balance, coordination and dexterity, but that the mental components are just as important, especially for children. With so many skills to be learned and experiences to be had, horseback riding is one of the most memorable adventures you can have as a family at Sea Island. Like the stables on St. Simons, equestrian events and venues around the country have storied histories. • When the first Kentucky Derby was held in 1875, there were 10,000 spectators. Last year, in 2017, more than 158,000 attendees sat in the stands. • The FEI World Equestrian Games are held somewhere new every four years, including countries like Sweden, Spain, Italy and France, but the U.S. is the only country (so far) to host two: Lexington, Kentucky, in 2010 and Tryon, North Carolina, in 2018. • Pimlico Race Course, home of the Preakness Stakes race, was built for $25,000 on a piece of land that was purchased for $23,500. A study by the Maryland Stadium Authority estimates that a renovation of the track would now cost upwards of $250 million. • Only 12 horses have ever won the Triple Crown, which is awarded to horses who win the Kentucky Derby, Preakness Stakes and Belmont Stakes, and only one has been in the last 40 years (American Pharoah in 2015). • The largest margin of victory in the Belmont Stakes horse race was 31 lengths by Secretariat in June 1973. It was the same race in which he was named the winner of the Triple Crown. • Saratoga Race Course in Saratoga Springs, New York, is widely considered the oldest organized sporting venue of any kind in the U.S., holding its first regulated race in 1863 before the official course was even built.